The employment rate of women with children increased between 1990 and 2010, especially among women with children under six years of age. 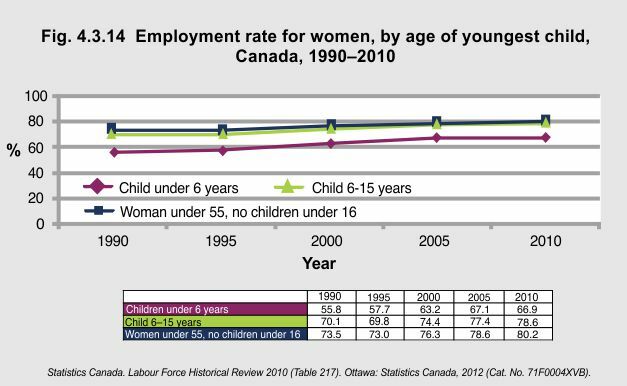 In 2010, the employment rate for women with children under six was 66.9%, up from 55.8% in 1990, and 78.6% for women with children from 6 to 15 years old, up from 70.1% in 1990. 1Ferrao V. “Women in Canada: a gender-based statistical report.” Paid Work. http://www.statcan.gc.ca/pub/89-503-x/2010001/article/11387-eng.pdf – accessed June 29, 2012.